Who wouldn’t want to have a backyard oasis? If you have been working hard and want to have a great place to relax and have fun with your family, having a backyard oasis is a great way to make sure that you get the relaxation and enjoyment that you deserve. In this article, we are going to talk with you about features that are going to help you create this oasis that you want. It may not be as easy as it seems to set up your backyard oasis, but you can get it done. If you know what you want and you work with the right team, it does not have to be difficult. What shape of swimming pool do you want? Do you want the traditional geometric shaped pool or maybe you prefer a free-flowing pool? Beach entries are becoming popular these days as well. If you are thinking about a backyard oasis, you might want to go with a free-form pool instead of something that looks more structured. While you might think that a pool is blue, there are things you can do to make sure that you get the color that you want. Look at the different colors of tile or vinyl liners that are available for your pool depending on which type of pool you are having installed. If you want to have more of a natural feel to your pool, you might go with a light green color. Since this is your backyard oasis, you can choose whatever color you want to choose. Once you know what type of pool you want and the color, you need to think about the landscaping around the pool. Stones and rocks around the edge are great when you want to create a natural looking pool. You can throw some shrubs, mosses, and cacti into the mix to make it more natural. These details help to enhance your overall look of the pool. You can build up rocks and landscaping on one side of the pool so you can get some shade when the sun is beating down so you can swim in the pool without getting too hot during the day. If you want to create a modern backyard oasis, you can use sago palm trees. This will help you get the green that you need for your oasis. Use a concrete slab around the pool’s edge to make it easy to enjoy. 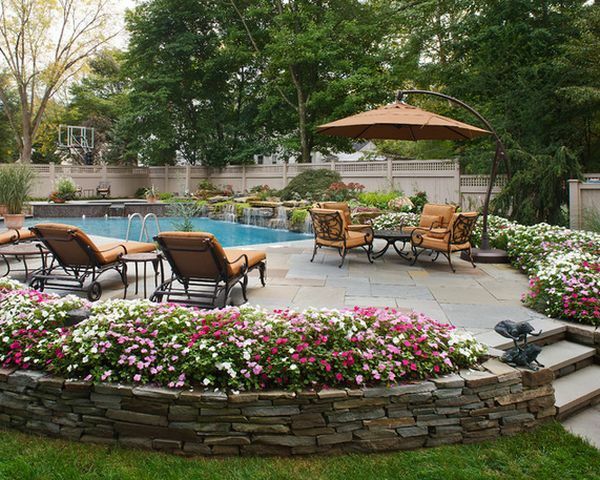 We can create your backyard oasis for you so you don’t have to wish it was here anymore. No matter what part of the process you are in, we can help you get to the end result so you can enjoy your pool faster. We have over 30 years of experience with pools so make sure to reach out to us and let us give you the results that you want.